A couple of months back, we noted that Drake was selling varsity jackets through Roots for a hefty $500. That price tag pales in comparison, however, to his latest jacket design, which costs a whopping $5,000. So why is it so expensive? 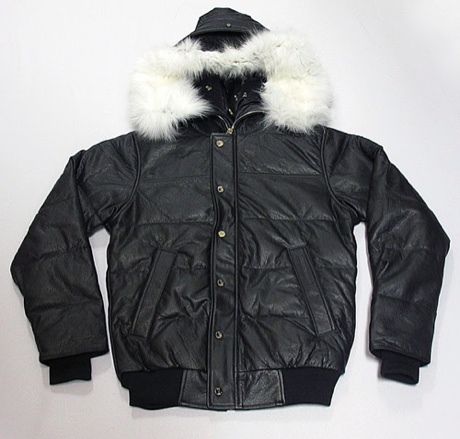 Well, this jacket was evidently made with only the finest materials, and its features include: buffalo leather, goose down, a silk-lined interior, a removable fox fur trim and 24-karat gold plated hardware. Yes, you read the right -- parts of this jacket are made with actual gold. This article of clothing is only available in a small selection of stores around the world. Canadians who can afford it now have a chance to buy one at Nomad in Toronto; it's also being sold at Nepenthes outlets in New York, Tokyo and Osaka. The jacket came out yesterday (December 29) and, judging by the photos posted on Drake's blog, is already being worn by many of his OVO crew members. It was made in collaboration with Canada Goose and is a luxurious update on the company's Chilliwack jacket design. The best part? The black and gold design means that this jacket would look fantastic on display next to our $700 Jimmy Page book. Thanks to Vibe for the heads-up.